Filled with the spectacle of the Paris Opera House in the nineteenth century, this classic work of mystery and suspense remains a riveting journey into the dark regions of the human heart. The tale begins as an investigation into the strange stories of an “opera ghost,” legendary for making the performers at this great Paris art emporium apprehensive when they sit alone in their dressing rooms or walk alone in the building’s labyrinthine corridors. Some even think they’ve seen the ghost in evening clothes moving in the shadows. 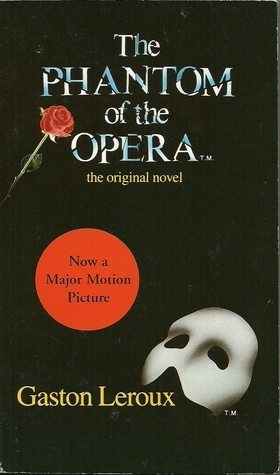 But it isn’t until the triumphant performance of the Beautiful Christine Daaé that the Phantom of the Opera begins his attacks — striking terror in the hearts of everyone in the theater. A story that has captured the imagination of audiences in adaptations throughout the century, Phantom continues to thrill audiences to this day as an unparalleled work of sheer entertainment. I think like most people I saw the movie first before reading the novel bearing the same namesake, and that’s what really piqued my interest in reading this classic. Both the movie and the novel differ in many ways that would almost consider them to be two separate takes on the story, but I think both are enjoyable nonetheless. The movie definitely incorporates elements from the novel and the novel itself goes more in depth into backstories and certain elements of Raoul and Christine’s love than the movie does. Speaking of Raoul…I hated him through the entire story. A good third of the novel is him moping around because Christine is giving him mixed signals (I’ll get to her in a second). He is a rich guy that has said numerous times that he knows he can’t marry Christine because of his title, yet continues to pursue her. Christine herself is okay sometimes…I get that in that time it was common for girls to faint and swoon at every little thing, but in today’s time no girl would put up with how Raoul was acting towards her. As for the Phantom himself, I think I had the most compassion for him. When you really get down to it he’s just a misunderstood guy. He wants to be accepted by society and live a normal life (with Christine). Of course, no one understands that and they feel he is a threat so they are out to destroy him. And maybe the Phantom shouldn’t have killed a few people, but I think it just boils down to him being misunderstood and never loved in his upbringing. Needless to say, I still ship Erik and Christine. If you want to read a really good retelling of Phantom of the Opera, you should try Susan Kay’s Phantom.